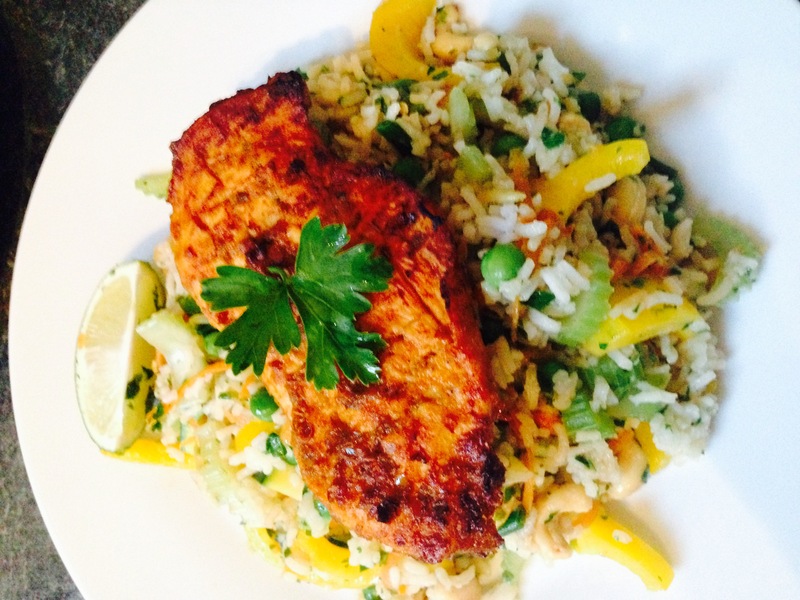 Peri peri sauce has 3 main ingredients, bird’s eye chillis, lemon or lime and chilli. Here i’ve added a few other spices to give a warm kick. Tastes amazing. To make the marinade, start off by frying the onion, chilli and garlic gently in all of the olive oil. Next, add the spices and cook for about 10 minutes, still on a low heat. Next add everything else, blend it thoroughly and it’s good to go! Slather it on the chicken and chuck it in the fridge, then leave it for as long as possible to marinate. Once you’ve got the chicken marinating, it’s time to get the rice ready. Job number one is to cook the rice then let it cool through. if you want to do it quickly, run some cold water through it. Once this is done, mix up some celery, spring onions, yellow pepper, grated carrot and grated ginger. Cut some slices of lime at the same time to cook in it. 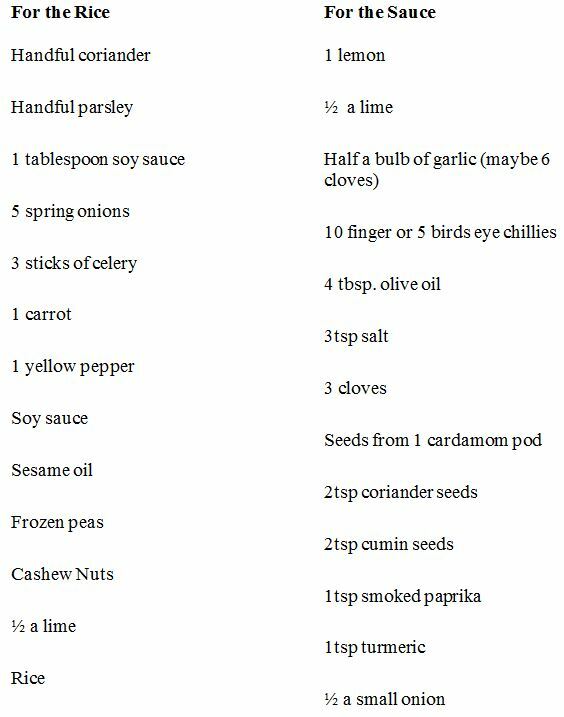 There is quite a lot of lime in this recipe, it complements the spice. slices of lime and a handful of cashews. Next, get that chicken under the grill, and give it about 5 minutes under a medium heat, then chuck a pan on the heat with a tablespoon of olive oil on it. The chicken frying, looking good! Once the oil’s heated up, chuck in all of the veg and fry it for about 5 minutes on a medium heat. Once this is done, add the rice, coriander, parsley and cashews and heat it through for another couple of minutes. Mixing in the cashews, coriander and parsley. Now get the mix out onto plates, and put the lime to the side to present. Then get the chicken out of the grill and place it atop the rice, get a sprig of parsley and place it on top.